I’ve long been a fan of Beneteau’s entry-level boats, the First 20 and the First 25. They’ve been around for decades, receiving numerous design overhauls and styling tweaks along the way to ensure they’re reflecting the sailing zeitgeist. The latest editions have twin rudders, centerboards and optional square-topped mains, making these nippy little boats easily transportable as well as ideally suited to gunkholing and other thin-water pursuits. But what if you don’t want a cabin, just a long, wide cockpit for daysailing or sail training? 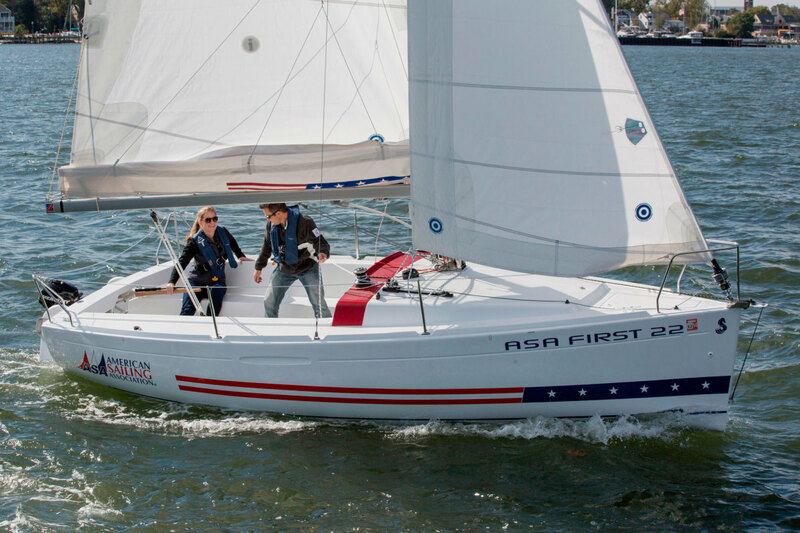 The American Sailing Association asked Beneteau America that very question, and the result of their collaboration is the First 22. 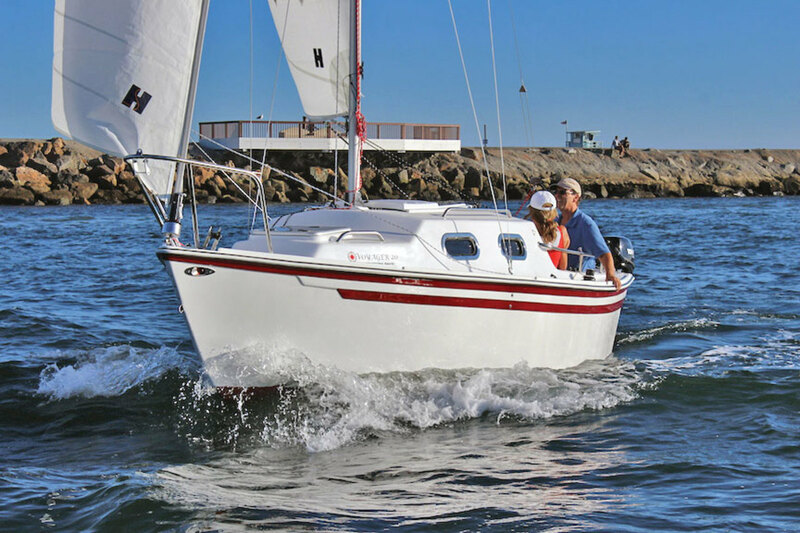 Based around the First 20’s hull with a new deck and cockpit mold, the 22 has a small cuddy cabin, positive flotation and a rig designed for sail training. Draft is just under 2ft 4in with board up and this $29,500 (base price) boat can dry out on its stub keel and twin rudders, making it ideal for shoal water adventuring as well as teaching newbies the ropes. Another long-lived boat that’s achieved near-cult status is the West Wight Potter, which comes in 15ft, 19ft and now 20ft versions. The Voyager 20 is a foot longer than the Potter 19 upon which it’s based, with a beefed-up build and rig, a fixed ballast keel and a more generous inventory to match its long-distance coastal cruising brief. Potter owners have undertaken some impressive voyages—at least one has sailed from California to Hawaii and back—so without actually encouraging such adventures, the Potter people have provided a more suitable platform for their execution. The Voyager 20 measures in at 19ft 10in overall, with a trailer-friendly beam of 7ft 6in, and its base price is $29,995. Speaking of trailer-friendly, nothing else comes with as potent a blend of portability and punch as a trailerable trimaran. Alliteration aside, Corsair Marine’s new Pulse 600 looks like an extremely enjoyable ride. At 19ft 8in LOA, and with a beam that reduces from 14ft 9in to 6ft 11in, the Pulse weighs in at under 1,000lb and is designed for a crew of up to four. Racing, family daysailing or camp-cruising? Take your pick. Price tag will be in the region of $30,000. 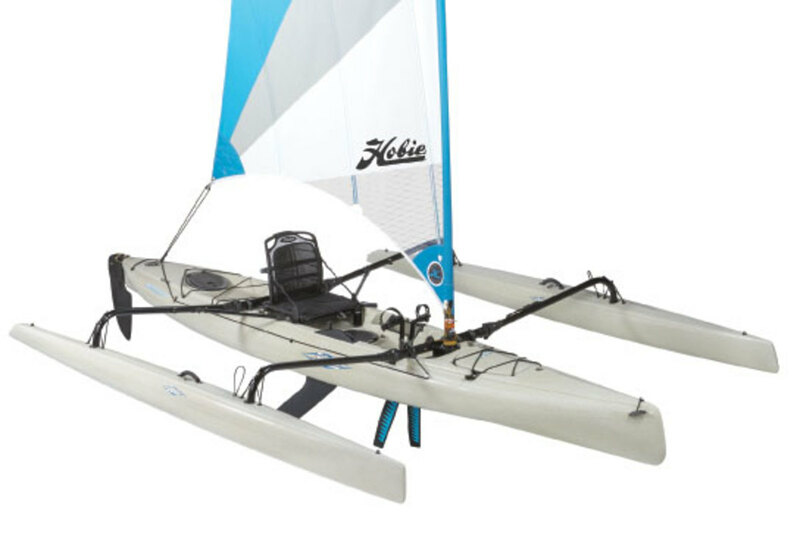 Hobie’s Mirage Adventure Island is around the same size as the Rave V, but it’s a trimaran of a different stripe—thrillseekers need not apply. Early iterations of this boat were basically a single-seat kayak with outriggers, but the 2015 version has been redesigned to enhance its sailing performance. The hull and the demountable amas have been given more volume and hence better sail-carrying and load-carrying capability. 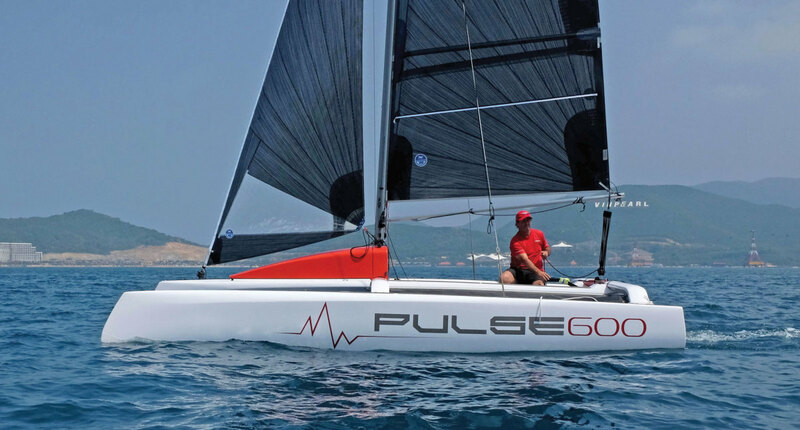 Sail area is some 20 percent greater, and the sail controls have been improved, as have the ergonomics; with more buoyancy in both the hull and amas, the boat promises a more comfortable ride in open water than its predecessors. At around $4,500, this boat looks ideal for low-key gunkholing, fishing or just plain messing about on a sunny afternoon. I saw the Diva 24 DC at a European boat show last year and was impressed not only with its attractive looks—the teak-lookalike antiskid on the deck and in the cockpit gave it some extra class—but its build quality and well-thought-out ergonomics. All lines lead aft in galleries to a dedicated working cockpit so the helmsman never has to leave the tiller to tend a sheet or halyard. Down below, there are four adult-size berths, a small galley and a head. Drawing just 1ft with the ballasted centerboard raised—6ft with it down—this boat looks like a very capable trailerable cruiser. And she’s fast, able to surf at consistent double-digit speeds under her big A-sail. If you were to buy one in her native Sweden, you’d be handing over the equivalent of $29,405 for a bare-bones boat. 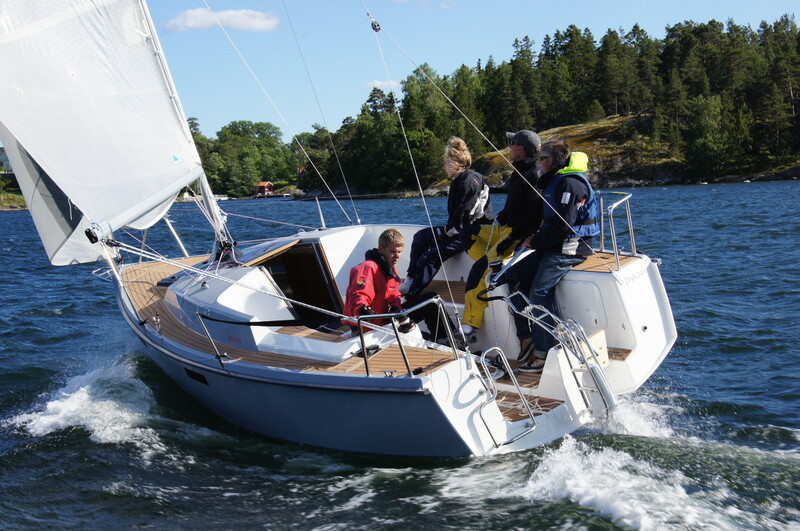 Another sweet-looking Euroboat—and one with a cool story behind it—is the Bente 24. It sprang from an initial idea for a simple, basic cruiser by two German small-boat sailors, progressed through concept work by a team of non-sailing design students whose professor was a circumnavigator, and ended up with renowned designers Judel & Vrolijk drawing the lines and a bunch of other industry heavyweights lending advice and materials to the project. This was mostly accomplished through a Facebook campaign that garnered 20,000 followers. 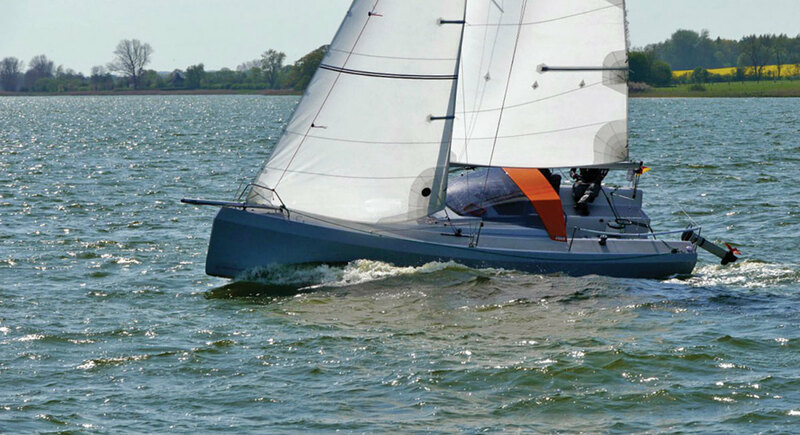 The result, just nine months later, is a sharp-looking boat that looks like a scaled-down Class 40 racer and is available with three different rig and keel configurations, from centerboarder through shoal-draft fin (cruiser) to deep-draft torpedo keel (racer). The chines are more than just a fashion statement; the entire boat is built of prefabricated foam sandwich panels that are stitched-and-glued together and then glassed over to make a strong monocoque structure. Ring frames instead of bulkheads tie the hull and deck together and take the loads from the tall rig and lead torpedo keel. This boat is built to last. In the world of sailboats, simplicity often comes at a premium price, but not in this case. For the base price of 25,000 Euros—that’s a hair under $28,000—you get a sail-away boat inclusive of all the essentials but minus soft furnishings and other fripperies. 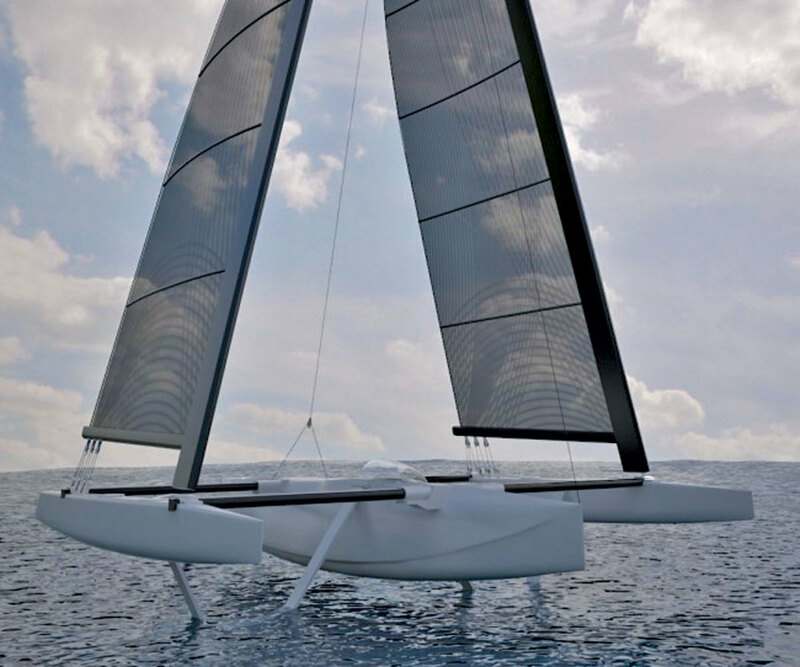 Could this cleverly designed little boat be the start of something bigger? 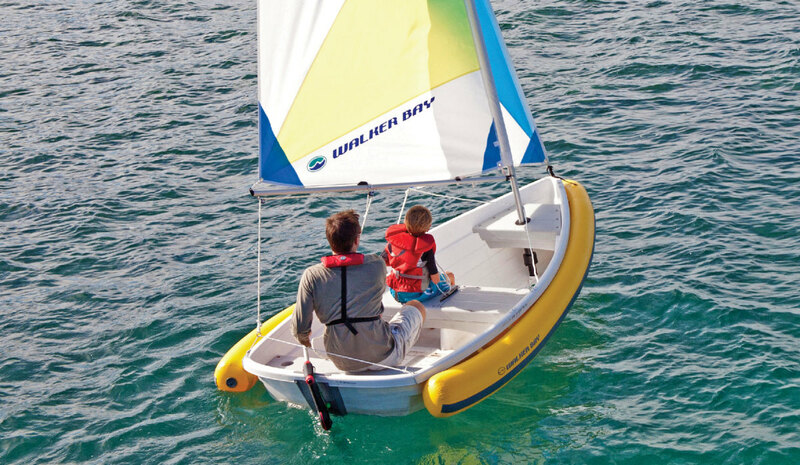 And now for something much smaller and even less expensive—Walker Bay’s 8ft and 10ft Breeze sailing dinghies. Introduced last summer, these injection-molded plastic boats are maintenance-free and nearly indestructable. The imitation-lapstrake hulls are stiff and stable and with their aluminum daggerboards and kick-up rudders, these look like fine knockabout dinghies for the kids. Their colorful PVC flotation collars make them safe too. The Breezes can be rowed or motored as easily as they can be sailed and look like good value at $1,850 and $2,580 (base prices) respectively. For more sailboat news, click here.